14th November 2016. When you hear the words "'80s fitness," what kind of image jumps immediately to the front of your mind? Chances are its big hair, sweatbands, leotards, and energetic music. All that equals one thing: step aerobics. Once among the greatest fads in exercise, step aerobics faded from view considerably with the exercise machine craze of the 90s. However, in recent years, several exercise and fitness routines which are spiritually similar to aerobics experienced a boom in popularity. One needs only to take a look at the increase in Zumba instructors to see that people love to have fun while they get active and fit! The time is right for step aerobics to enter the spotlight once more. In fact, step classes are more common than ever, with many people attending weekly just like in the 80s. 2017 is poised to be the year aerobics makes its comeback ? but why? From the popularity of those aforementioned dance exercises to the many benefits step offers its practitioners, one could pick from any number of reasons. Let's zero in on what makes step aerobics so good for you and how it ties in with other exercises like Zumba. By the time we're through, you'll be ready to reach for the hair bands! Just because step aerobics has faded from the public consciousness doesn't mean that its legacy doesn't continue. Class-based exercise and group fitness regimes are more popular than ever. As a matter of fact, the continued rise in popularity for these activities encourages more research on the benefits of group exercise. The regular pattern of exercise group classes offer is a benefit in and of itself. That's not to mention that the social interaction is essential for overall wellness, and an excellent way to avoid boredom. When you can't keep your attention on fitness, it's easy to drift out of the habit. With a group, though, that's much harder ? everyone wants to stay involved! One needs only to look at the consistent popularity of Zumba, the dancing workout class, to see the demand for these kinds of activities. When coupled with its highly aerobic workout and calorie-burning benefits, it's easy to understand why the activity grew so rapidly. However, Zumba's own popularity reached a plateau in recent years. 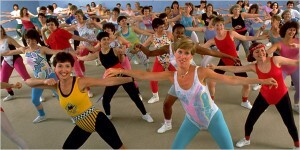 That means the time is ripe for a new activity to move into its place; step aerobics could very well be that activity. Other exercise activities, like crossfit and barre classes, are also held in a group environment. These sometimes function on a more individual level, though. Nonetheless, the popularity of group fitness and the increasing awareness of its benefits means step aerobics deserves a second chance. After all ? there's actually a very popular workout style right now that's already a lot like step. Les Mills International, a fitness company growing in popularity for developing a diverse range of fitness activities, features several activities like step aerobics. However, some of the activities feature a little more structure than your basic step class. This is because Les Mills fitness focuses in part on fitness choreography. Think of it almost as like a Zumba class with a less freeform structure and a greater focus on actual fitness results. Step aerobics indeed became something of a joke after it faded from popularity. However, the return of dance-based activities and coordinated group exercises signals a change in perception. Classes are more frequently advertised as welcoming spaces, where everyone who wants to work on their fitness is welcome. That's the spirit which defined the positive aspects of step classes in the 80s and 90s. Les Mills similarly makes a point that its workouts are judgement-free zones. Tapping into this desire for a welcoming and engaging workout space is why step is ready to explode in popularity again in 2017. You could be a part of the first wave that returns it to the mainstream! You might be curious, though, about the actual reasons to take up an aerobics workout? We can answer that. 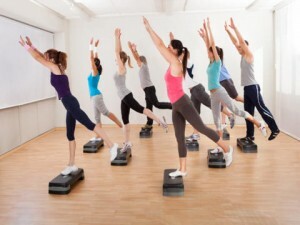 Let's "step up" to taking an in-depth look at what makes aerobics such substantial exercise. Everyone didn't just wake up one day and decide leg warmers and stepping up and down on a box was a smart idea. The trend blossomed gradually, and for a good reason ? aerobics are simply one of the best workouts for your heart. The longer you spend with your heart rate elevated during fitness activities, the more calories your body burns to keep up with its energy demands. There's no denying that step aerobics is excellent for blasting fat away. An average one hour class in step will burn at least 500 calories. That's a huge advantage for anyone looking for an easy and fun way to work on losing weight. Modern aerobics classes also seem to be moving beyond the basic step up, step down formula from the 80s. Now, incorporating hand weights, extra arm movements, and additional choreography mean that step can work out more than just your heart. Adding in additional moves boosts the rate at which you burn calories and rounds out the workout. Step is also a relatively low-impact exercise, meaning that while your heart is beating, your joints and ligaments don't take a pounding. Those with severe knee issues may encounter problems, of course; otherwise, you should feel free to step as much as you like. Increasing the height of your box can up the challenge, too, making every session even more demanding than the last. The physical benefits are real and worth the effort. Aerobics could make a comeback for other reasons as well, though. Beyond being a great workout, it's easy to fit a class into your routine. Not only that, but you can choose to use aerobics as a gateway to other exercises. There's simply no denying that we live in a busier world than ever. Not only do we stay continuously connected to one another with smartphones and social media, but it seems we always have another obligation demanding more attention. Taking the time out of your day to spend hours at the gym simply isn't feasible. Meanwhile, the temptations of fast food and junk calories loom large! How can we fight back against the sedentary lifestyle this kind of schedule encourages? It's step aerobics to the rescue once again. Whether you choose to join a class full of people or to stay at home and step along to an Internet video, it doesn't take long to burn off the energy necessary to improve fitness. If an hour can burn five to six hundred calories, then even a half hour of really intense step can make a difference in your fitness. Finding the time in the early morning or evening for 30 minutes of exercise is much easier than blocking out hours for gym and travel time. The low barrier to entry ? the equipment requirements are practically nil since you only need a step bench ? also makes it ideal for casual exercise. Finally, consider that trying out aerobics could open up the door to other activities. Once you've improved from your baseline, you might decide to try the gym after all. Whether you ride on the spin machines or choose to go swimming, these other exercises will benefit you even more than just aerobics alone. That could perhaps be the best reason to think they're poised to make a comeback ? it can easily fit into our Internet-enabled lifestyles. Next year, don't be surprised if a bunch of new web video stars emerge in the fitness category.